My Christmas story is about the love of a mother for her child. when I saw those Ed Sullivan Shows. 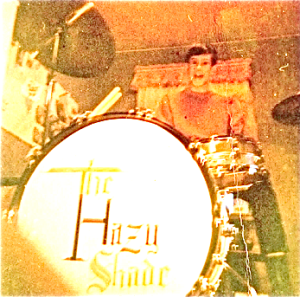 Fast forward to my early years studying drums and playing rock music with my friends (10 years old) - many of whom owned the finest electric guitars, basses, farfisa's, etc. I played a snare drum and one cymbal. Until the Christmas of all Christmases. I got that pink champagne sparkle Ludwig bass drum! Not an entire set. My mother worked hard as an elementary school teacher so this alone was a major expense. As foolish and crazy as many parents thought rock music was at the time, my mom never gave up her support for my musical endeavors. Needless to say, I "built" that whole Ludwig drum set over the years one drum/cymbal at a time and it felt so good when I finally had the entire set. That gift from my mother started me on my musical journey and it touched me in a way that would shape my life forever. My mom passed a few years ago, but this memory is one I re-live with her every holiday season. Phillip Klum hails from the music-rich midwestern city of Ann Arbor, Michigan, where he grew up to the diverse sounds of Motown, Motor City rock-n-roll and the Detroit and (not-too-distant) Chicago Symphony Orchestras. He lived and worked in Los Angeles before making NYC his home. A published singer/songwriter himself, with a wide variety of musical talent in his family background, Mr. Klum brings a vast musical scope as well as close to 20 years of audio restoration work to the mastering session. His massive body of restoration work includes projects for PBS, The Alan Lomax Collection and many films including The Aviator (Martin Scorsese) and Jonestown: The Life and Death of Peoples Temple.